This is a about choosing my main instrument. The main inspirational instrument in the studio as well as the centerpiece on the live stage. After working for almost 20 years with the Korg Triton Pro it was time for something new. The old monster weighed a ton and it was a traditional workstation with sequencer, sampler, MOSS synth and ROM synth. I actually used only half of its functionality. Storage was on either a floppy disk (!) or a noisy SCSI disk (40MB!). 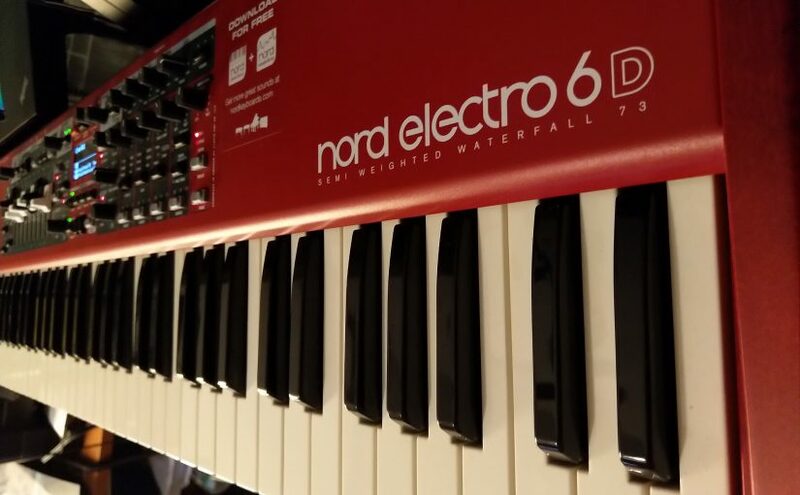 Why did I go to the Clavia Nord Electro 6D? Of course, the Electro 6D is a well known and excellent instrument and there are plenty of reviews, but why did I chose it? The main appeal was a single feature that I once had on an old Roland (D10?). It kept playing the sound as you switched programs. It sounded a bit garbled, but at least it wouldn’t cut off the sound while switching. A major irritation when I switched to the Korg. The Nord 6D series and other Nord instruments of the same generation bring this back, but this time in its full glory. The notes you last played keep playing, when you switch programs. Every key you hit after the switch plays with the new sound. This is perfection for playing live! The other thing is: I noticed that almost all my music centers around piano, strings and organ sounds. This is where the Electro 6D excels. All sounds that don’t need pitch bend and you might have noticed that the Electro 6D doesn’t have it. The occasional whoosh and bleep and bloop can come from other instruments. Because it doesn’t have all the controls and in general isn’t made to be a master midi controller I use the Komplete Kontrol A49 in the studio for that. It has a very similar touché also. 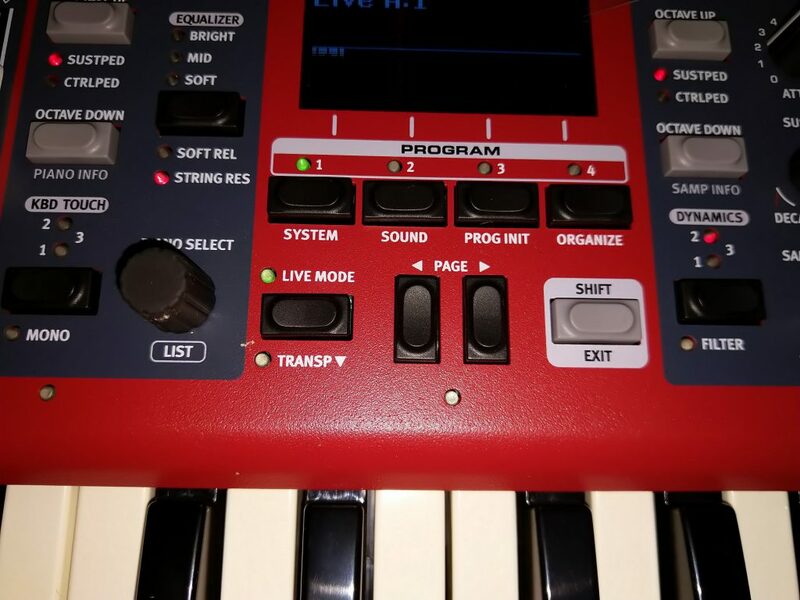 Another highlight of the Electro 6D is the Live Mode program selection in the center controls section of the keyboard. This switches the four program selectors into a set of pages with your favorite preset sounds. Including all mix and effect settings. This what I desperately need live. I used to move around sounds to have them as the first programs in the list, but with the separate Live Mode list I can put them right there and leave the program list as it is. Just to be sure I made a backup of my Live Mode favorites to have them back as I want, even when something gets twisted and accidentally saved as part of the Live Mode preset. Then some small niceties. 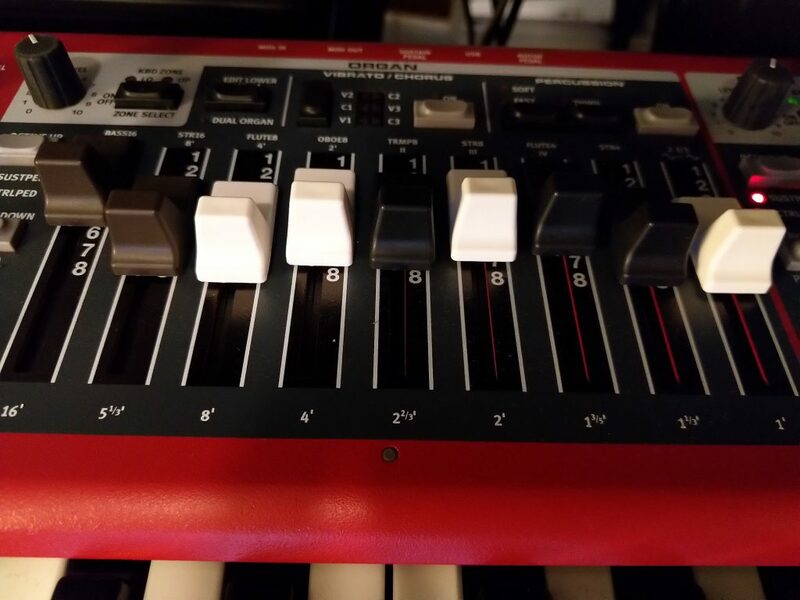 I chose the Electro 6D and not the Electro 6HP for the real organ sliders and its lower weight (9 kg instead of 11 kg). I have always played springy keys. In that sense I am not a true weighted keys piano player. I don’t use split keyboard sounds currently, but in the past I have used splits live also and the Electro 6D has the guidelight splits for that. In short, it has all the things that I dearly need and not a lot more or less. I guess most musicians use Ableton Live live like I use it. Its kind of the standard way of building a live set. This article describes the details in the implementation as I use it. So there is Session View with the track channels laid out with different instruments and the scene rows with the different songs. Within each song several scenes with the intro, verses, choruses, break and outro. 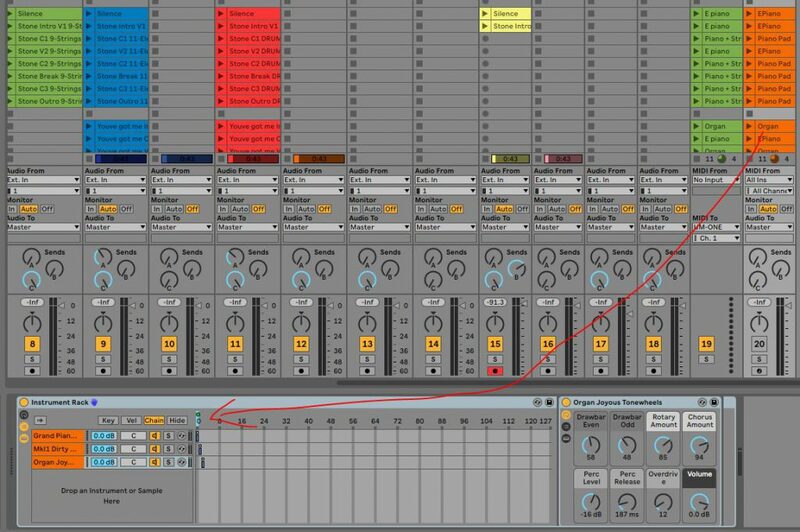 Ableton will follow the bpm mentioned in the description and you can set the Launch Follow Action to let Ableton run the flow of each song. 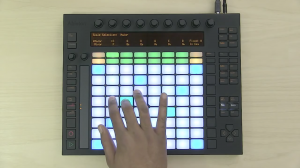 This way Ableton will back your song live with the right scenes with the push of a button. With effects automated or manual as you want it and in the correct tempo. Additionally I use MIDI Program Change commands to instruct the Nord and the Korg to switch to the right instruments for any scene of any song. In my case I play solo, or with aid of other musicians. I can choose which track to leave out, the backing vocals, the bass or at least one or more keys. 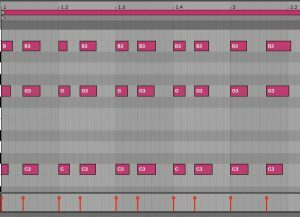 On the whole Ableton Live runs the show in my case, so I should be careful not to bore the audience with too much music out of the box. I should keep working on performance, video tracks and light effects all the time. 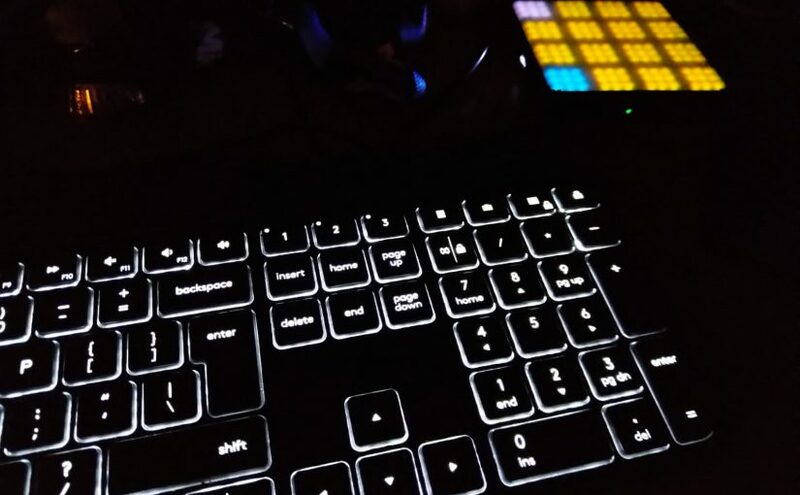 I try to use only Ableton Push, avoiding the use of the laptop to start and stop. Lets start cheating a little. Because not every track has drums, I rely on a click that gets routed to the monitor. In the above picture you can see the click track on the left. It just plays and plays and gets send to the Cue out Return Track C. Return Track C works pre-fader so it is in no way linked to the master mix. The cue out goes to a separate output on the audio interface and thus can be mixed to all monitors. For now this suffices. All live instruments, vocals output and everything from Ableton Live gets mixed in by the audio interface. The audience hears the Master Out mixed and on stage you hear the Cue Out mixed with the click. My live set contains an instrument rack that is setup to be a playable, plug in based copy of the most important instruments I use live. Should an instrument break down, I will then have the option to use any MIDI keyboard to replace it. The plug in sounds are not as nice as the Nord and Korg sounds, but I will have something to play instead of nothing. To make sure that I will always have a way to recover in case of emergency the entire live set is stored in the Cloud. This way I can fine tune the Ableton Live live set from home and push it to the Cloud. The moment I open the laptop for a show and there is Internet it will sync up. I use OneDrive but any Cloud product is fine. Should the laptop break down, from any other laptop I should be able to recover the Ableton Live install, a few plugins and packs and any interface and sync the live set again. At the last moment a backup laptop should be ready to swap in on the spot if needed. Lets pray it will never come to this, but if it can happen it will. After diving into the basics and getting it to work it was time to really start using it. First off, the concept really works. I have songs without drums. Practicing these can be tough, so I tried working with a click track in the monitoring. That helps if you get in the flow. But after using the Pulse a few times it was completely natural and my mind “felt the beat” and leaned into it. It was important for me to tone the default “hard buzz” of the Pulse down to a more subtle vibration level. Now it really works for me. The battery life of the device is excellent for me, I have been practicing for hours now on end and its not even half empty. Charging it is a bit fiddly though. There are however several problems with the product. If you look over the appearance, because it looks and feels very plastic and rough at the edges, what are the real problems? At this point and time, for me the Ableton Link feature does not work reliably. If in an Ableton Live session the tempo changes for a new song, I do not know when of if the metronome app will pick this up. This should be a simple bug to fix, or I have a unique setup in my WiFi network, Android version (latest version of Android Pie – 9), or something else is wrong. I am willing to try an iPad in the near future to see if it works better. Then there is of course the problem that its three devices. Your laptop, a phone or tablet with the Metronome app and the Pulse all have to be fully charged and setup to make this work in a live situation. On several occasions I had to reconnect the phone to the Pulse to make or keep it working. Even if sync between laptop and the Metronome app does get fixed all devices need to be on a perfect working WiFi network on stage and how realistic is that? I think you can see that this device is probably at its best while practicing or in the rehearsal room. Only if you have a dedicated professional crew on stage to keep it working it might just work. In short, I cannot do without anymore when practicing. I would never try to get this to work in a live situation. Maybe it all gets fixed in the next version, the Core. Lets wait and see. This product appears everywhere in timelines on social media when you’re interested in making music. I must say it immediately got my attention when I saw it. For me the appeal is that would solve the problems playing along with the computer when practicing or playing live. I don’t always have live musicians to play along with and the computer is unforgiving. Any metronome is welcome there and the SoundBrenner Metronome app is then already of great help. But now the Pulse is there and it adds to this a haptic vibrating metronome you can feel. Now you don’t have to look at blinking lights while playing. Also, I use Ableton Live, also live, and there is even the possibility to use Ableton Link with Metronome app. 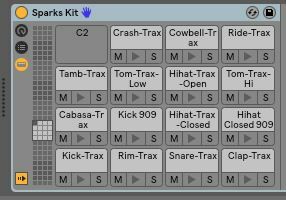 If this all works together as one integrated haptic Metronome that allows me to feel the tempo while playing along with Ableton? Perfection! The ultimate gadget heaven! Before buying I always look around for reviews and more info. One big complaint is that it is not an actual watch kind of thing. A lot of people hoped that it would also display the tempo. It doesn’t. You have to look at the screen of your phone (or tablet) to see settings and tempo. This also means that you have to keep the phone screen on. At the same time the Pulse is connected via Bluetooth. The phone is the brains, so you must at all times keep it charged and connected. A challenge, specially live. Then there is some word going around on it not being accurate, but I think that is already fixed now through firmware updates. Another complaint is that it takes time to get used to ‘feeling’ the tempo. I guess that a lot of people send it back immediately, but I am more patient. Most new skills take time to get used to and I am quite convinced that this Pulse is a good idea. But now for first impressions. When you first start using the Pulse you will find that it is a bit fiddly to operate. You have to tap the watch face to start using it, but its not really touch sensitive. You have to really press it to pick up the taps. Then, straight out of the box it is set to really buzz the rhythm very strongly. And audibly also. Fortunately you can immediately go back to the app to set it to a more friendly and short vibration. 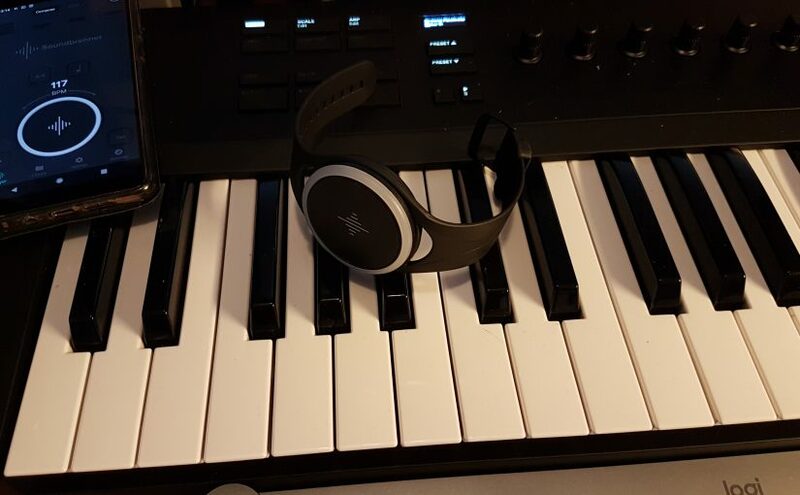 In the lightest mode it really feels okay, but I play keyboards, When playing a more physical instrument, like drums, I can imagine you need the stronger buzz. Charging it is also fiddly. It is a small kind of dock that has to properly connect to the device. After popping the Pulse in the band it gets even harder to let it connect to the charging dock, because the band pushes it from the dock and the dock can easily slip away, because its so light. People complain about the time that the device can be used on a full charge, but I don’t have enough experience now to say if it is really a problem for me. Then its time to start practicing and linking it up with Ableton Link. That’s where all starts to get a little bit flakey for now. Ableton Link somehow goes in and out of the connection with the app. Which is ok for practicing in my case, but I don’t think this is ready for playing live. Also my phone sometimes loses connection with the Pulse after several minutes of playing. My phone is an Android phone, running Oreo and I know it can be very aggressive in killing background processes, specifically if they draw power. Probably that is not helping here, so I want to try it with another iOS device also. One other thing to mention: its quite a big device. Maybe better suited for male wrists. There is another bigger strap in the box for your leg or your upper arm, but this device will have a hard time looking elegant on fragile ladies arms. I hope this helps you appreciating the device for what it is now. I will keep using it and I’ll keep you up to date. 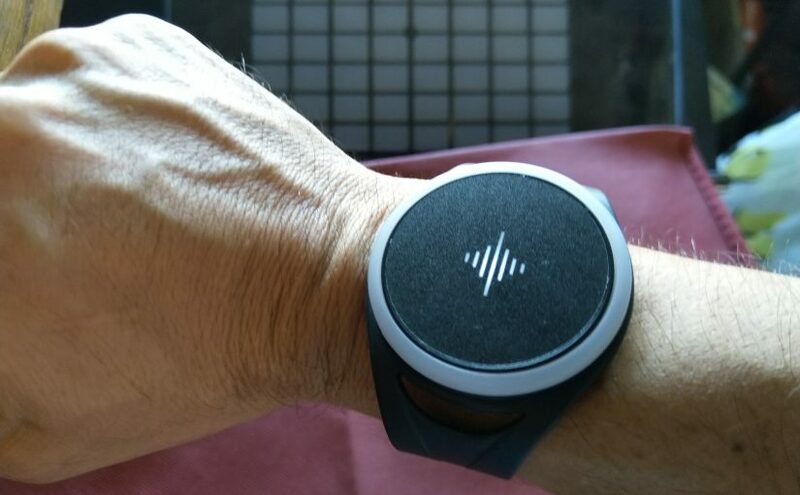 Please note that there is also a new Soundbrenner device on Kickstarter that is actually more like watch, the Core. Inputting music with a mouse and a computer keyboard, even though its possible in most DAWs, is (as I see it) very limited. Firstly in its expression, it misses touch sensitivity so by default every note typed has the same velocity. Not good. Secondly because when you start adding expression, for instance by drawing it with the mouse, you are focusing on the details not on the song. What better way than a MIDI piano keyboard that allows you to input music in an expressive way in one go? Well, it might be that the piano keyboard is not your thing, but a guitar or flute is. Then you might want to use that to input notes. But other than recording the sound from the instrument is that any use when you want to record different sounds? Probably not. The most flexible way to record music is through MIDI notes and expression. The recorded notes can be connected with different synthesized or sampled sounds and voila. Lots of room for experimentation. The last one is the latest addition and the inspiration to start writing about it. The Push and the Launchpad were in a way less inspiring to use than the Lightpad M or so it seems. 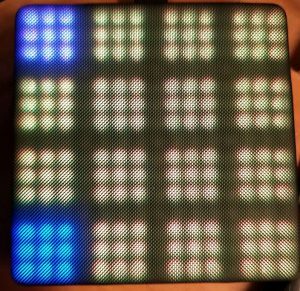 Also, the Lightpad M is nice and soft. 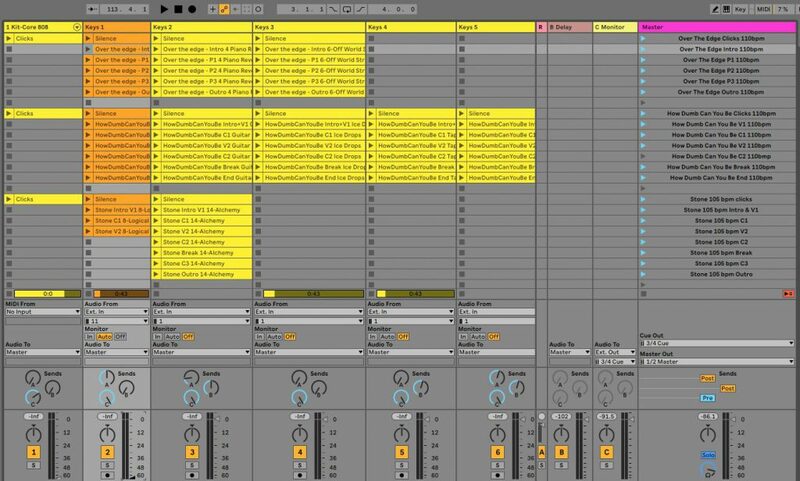 When trying to find my way on the Push, I found that its main inspiring purpose for me is controlling the Ableton Live Session View. For the Launchpad this also seems to be the main purpose. This is the view that you would use when playing live, or when jamming and piecing together a new song. 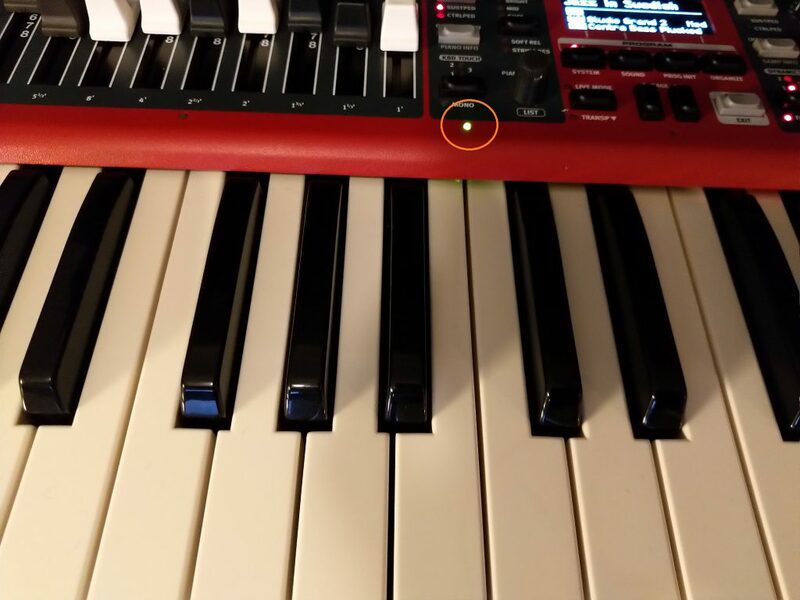 The jamming and piecing together a new song has some clever tricks to allow you to enter musical notes and make sure you’re never out of key. But then you have to set the right key to play in. And what if your song modulates through several keys? Not very intuitive there when I tried it. Most dance mixes keep it simple, so fair enough. And of course since its first inception these products have evolved and I might not have caught up. It is probably better than ever, but probably most for people that do not enjoy playing on a regular piano keyboard. Maybe you noticed that I said musical notes, because its different for drums. When the pad changes to a drum pad it is actually better than hitting the piano keys. The mapping on screen is already a square 4×4 pad in Ableton and when you have the same mapping on the pads of Push or the Lightpad M it all starts to make sense. I found that the Lightpad M takes some practice (for me), but in the end really results in inspiring drum tracks. Until now I used Xfer Nerve as a drum machine and then layered real drum loops and recording over it. Starting with the Lightpad M I see an alternative. Expressive in the Roli way and intuitive. The labeling on these is so tiny that you can’t see it from the audience, but I’m guessing its mostly the Launchpad. The Lightpad M is, like others of its kind can also be charged and used wirelessly, MIDI over Bluetooth. I would personally not bet my live performance on a wireless Bluetooth connection, but that’s just me. So in short. I am sold on the concept of using pads for triggering sounds and drums, being a piano keyboard player. If I look around on the live stages, its here to stay. When you are not a piano keyboard player it might just be your new way to play notes. Please note: If you are experienced in mixing this article will probably state the obvious. This blog is mostly intended as a “note to self” and everybody else that cares to take interest. 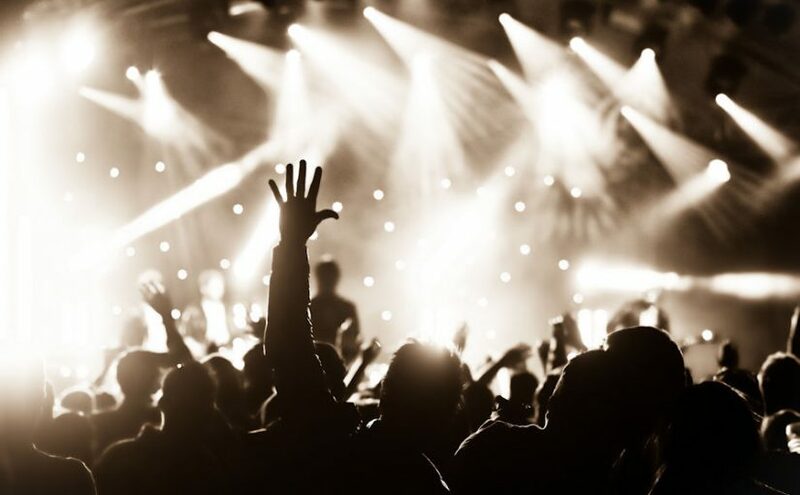 Recently one of my music friends Hanny told me that she had performed at a gig with her new band HannaH (check it out) that was broadcast live on local radio. Of course, she had asked for a recording that could be used for promotional purposes. There seemed to be no problems with the actual broadcast, but the recording behaved very strangely. When listening on a phone, the guitar disappeared. When you listened with headphones, your head would explode. The whole mix seemed strangely unbalanced. Phase problems… But we got out of it with a result that was even better than the original! But the top signal seems ok, right? Well its drawn maybe a little incorrectly. The top signal actually has a little more richness of the waveforms to it and a little of cancellation. When used right, you will have a Phaser effect. Something you can find in any DAW and set of guitar effects as an effect that also wobbles the phase to add a little excitement and widening to a otherwise boring signal. 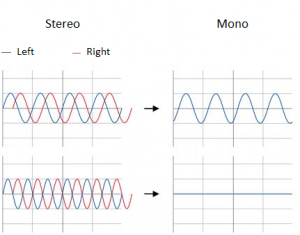 Overdo it, or mistreat a stereo signal and you get cancellations and left and right stretched to far. It can result in headaches while listening. How to get out of here? So you now you have a mix with phase problems and its not your mix, just a stereo sound file. Aside from plugins with the purpose of fixing phase problems, is there a way to get out with just the tools you have? Fortunately for me there is. Ableton has a utility effect section that centers around treating left, right and mono signals from a track. I am quite sure that your DAW has similar built in effects. The trick here was to duplicate the signal and create one track with the phase difference signal and one track where left and right were mixed into a mono signal. Now one track only featured the guitar. Proof that there was a phase problem with just the guitar in the stereo mix. The other track featured everything except the guitar. When mixing both in mono suddenly I as able to remix the recording! Do you want more or less guitar in this song? No problem? All problems solved for HannaH. Good enough in mono, because the audio was for promotional purposes. Once again like in a Dutch football proverb: Every downside has its upside. Happy mixing! Why start a blog about making music when there are so many blogs? When there is youtube where you can learn anything about everything in 10 minutes? This blog is more a reminder to myself. Making music is about inventing something new for every song. Of course i hope that you can also find something here that inspires you, or helps you when you get stuck. This blog is about working in a small home studio and performing on stage. Also probably some words about publishing your music and having fun or frustrations doing so. Enjoy!